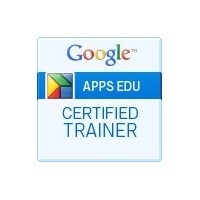 Becoming a Google Apps for Education Certified Trainer has allowed me to train teachers and administrators how to incorporate Google Apps for Education into their classrooms. I have had the opportunity to work with neighboring districts and at the college level at Wright State University. This training has given me an opportunity to meet and collaborate with many educators that has left me a stronger educator. Google Apps for Education is a collection of applications for K-12 and higher education institutions. Applications include Google Docs, Sites, Mail, Calendar, Groups, Maps and more. Google Apps for Education integration has allowed students to work collaboratively on a single presentation or document while on different computers in different locations creating one cohesive document in real time. When using Google Apps, teachers can give students direct and specific feedback on papers and assignments anytime, and students can make corrections and additions and resubmit work without waiting for class to begin. The certification signifies that I am able to assess and improve the use of interactive classroom technology, and that I can provide mentorship and support to staff. Compiled below is a small sample of projects and events from my teaching career. Click the pictures and titles to see more information about each item. The Technology Site was created while serving as the technology coach at Waynesfield-Goshen Local Schools. It features student and teacher resources for each content area and topic as well as help guides. This site has had not only helped to put interactive sites and resources at the fingertips of the students and teachers at Waynefield-Goshen but has been frequented by many others. Since the sites creation in October 2010 it has been visited over 55,000 times by someone in every single state as well as 122 different countries. Smart Exchange is a collaboration website maintained by Smart Technologies for teachers to share resources for use on SMART boards. Several of my self created resources are featured on this site. Click here to view the SMART Notebook lessons and SMART Response Quizes. Using Google Sites, I created a template that is applicable across all grades and subjects. Trainings were held on both how to use this template and how to map their curriculum. Teachers at Waynesfield-Goshen then used this template to create a basic map. Flat Stanley made its way to 3F at Parkway Elementary in the Winter of 2010. We documented our day with pictures and text to create a book that was sent to the 3rd grade elementary classroom it originated from.